Product information "HAIX Fire Flash Xtreme Womens, FS"
NFPA quad-certified, these Fire Flash Xtremes are structural, HAZMAT, USAR, wildland fire boots for women. These wildland fire boots for women are a great alternative for those who have trouble stepping into pull on bunker boots. These discount fire boots can accommodate wider calves and/or ankles with its adjustable built in lacing system. With the easy run lace/zip system, you can be assured that you can step quickly in and out, especially with the added pull tab at the back. Have a prior ankle of foot injury that needs extra support? Fire Flash is the perfect choice since you can adjust each boot individually for a custom fit; cinch lacing tighter for additional support. With the HAIX® Lacing System you can adjust your boots easily and quickly - similar to a zipper boot with the fit of a lace up type of footwear. Flex zone construction around the tongue ensures you will still have the flexibility with these discount fire boots to perform the job at hand. The Fire Flash Xtreme offers European craftsmanship and HAIX® technological designs and specialized materials, which keep your feet dry and protected from blood borne pathogens, chemicals, and more. Lots of flexibility in the ankles and secure hold in the heels means your feet can get where they need to go without straining your foot muscles or suffering ankle roll. The HAIX® Secura Liner in these wildland fire boots for women will stay in place. It will not wrinkle or pull out of your boots. It is permanently affixed and designed for maximum comfort and airflow. Female first responders will be proud to wear these wildland fire boots for women, which are constructed of quality, solid leather. The leather is waterproof and comes with Sun Reflect technology to keep the sun on the outside of the boot rather than warming feet on the inside. Para-aramid cut protection provides an added level of protection to feet on duty. A steel protective toe cap with exterior profiled rubber toe cap not only keeps your feet safe and protected but keeps your boots looking great. It also provides abrasion resistance when crawling. The HAIX® MSL System (Micro Soft Light) designed sole offers a PU foam injection throughout the sole for maximum comfort and great shock absorption. The MSL System is also excellent at insulating feet from the heat or cold. The steel puncture protective sole in these discount fire boots contains a flexible, stainless steel layer to keep feet safe from sharp objects while still allowing some freedom of movement when driving a truck or performing your duties. The outer soles of these discount fire boots are made from heat resistant rubber which is also slip resistant. 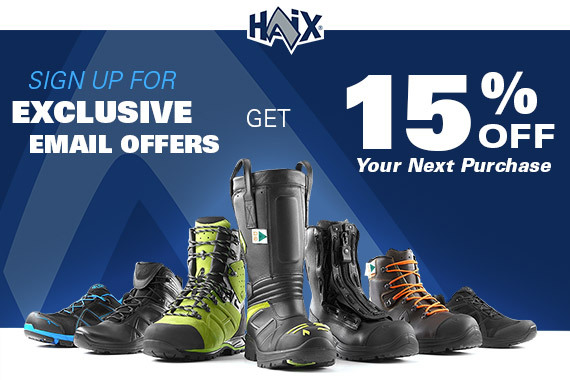 Related links to "HAIX Fire Flash Xtreme Womens, FS"
Our comment on "HAIX Fire Flash Xtreme Womens, FS"
Customer reviews for "HAIX Fire Flash Xtreme Womens, FS"